Journey, the memories, the dreams and the reflections along the road one travels, has been a constant theme in my painting. I sometimes see reality as a series of dreams, of encounters, of momentary, fleeting fragile yet often beautiful experiences. Italy, where I spent ten years and where we still return yearly, has been and continues to be a strong source of inspiration. Memories of people and of the Italian landscape with its extraordinary light have influenced my painting. [click image to enlarge]The road one travels, roads, streets, strada, strade, the journeys we take and the paths we travel. 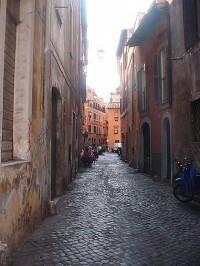 September 2000 found our family in Rome, living in Trastevere, one of Rome’s oldest and most characteristic sections. My husband, Robert Proctor, Professor of Italian, had brought twenty Connecticut College students on a SATA (Study-Away Teach-Away Program) to study at John Cabot University located in Trastevere. Rebecca, our daughter and Andrew, our son studied at the American Overseas School in Rome. We had a small apartment in the heart of Trastevere, a block from Santa Maria in Trastevere, perhaps the site of the first Christian church. That year, morning after morning, a family ritual developed. Shortly after 7a.m. the four of us would walk down the worn stairs of our dwelling stepping out of an old wooden front door onto those ancient semi-darkened cobblestone streets. We headed slowly down the meandering maze of streets toward the Ponte Sisto, a 15th century footbridge which crosses the Tiber. From the center one can view Michelangelo’s dome of St. Peters. Rebecca and Andrew were on their way to catch the school bus and Bob and I would walk along stopping for cappuccino and a newspaper before going on to our work. [click image to enlarge]Early mornings I would study those dark, narrow, timeless, cobblestone streets, cobblestone pavements where generations of humanity had walked. The buildings themselves were presences in subtle shades of rich browns which varied in value and texture. The facades of the ancient apartments which had witnessed so much life were etched by time. Cool blue and lavender shadows played on the streets giving way to glowing shafts of Mediterranean light. Shapes of brilliant blue Roman sky were carved by the tiled roofs. The blues were striking, juxtaposed against the ochers, umbers, and occasional touches of reds, pinks and oranges. Morning after morning we walked treading along as had so many many others down those timeless semi-darkened streets toward the pinks, toward the reds, toward the blues, toward the light. Buio, luce, buio, luce, darkness, light, darkness, light; luminous Mediterranean light casting its glow on still standing Etruscan arches and ancient roads in Rome, Perugia, and Tuscania has intrigued me since 2002. 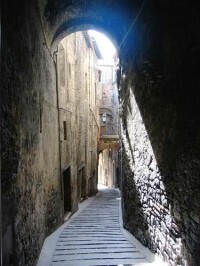 That year my husband and I began to journey yearly to Perugia to teach in the summer session at the Umbra Institute. Since 2003, I have led three pastel workshops out in the countryside near the ancient town of Tuscania an hour north of Rome and in 2012 and 2014 in the hills around Fiesole. Memories and reflections of Roman and Etruscan arches along cobblestone roads filled with the mystery of countless other journeys spanning the centuries provided inspiration. Our journey in 2015 on the way to a conference on Classical Studies in Sestri Levante led us to San Terenzo in Liguria where we spent six months in 2016 and again in 2017. The ever-changing infinite sea and sky with its luminous light has inspired these most recent pastels. In a world where we are constantly bombarded with images of violence I find myself searching in my art for beauty, for peace, and for images of meditative spaces.